I have a dear friend who's been in the US for years. I consider her to be my "cyberbunso" as I call it, like a younger sister in cyberspace. We've known each other for 12 years and I've seen her grow and mature to be a very great person. I do act as the "kuya" and not having any brothers nor sisters, made me appreciate the role even more. We've been kinda out of touch lately. Both of us have been busy. I did manage to send her a Christmas card for the recent Holiday season. On the last day of 2006, I got a text from someone confirming my address and asking for directions. I later found out that a cake was trying to be delivered to me. Too bad, it didn't reach their cutoff time as they closed earlier that day. I was told to expect it after New Years Day. Until that time, I had no idea who sent me a cake and why. But the thought of someone actually giving me a cake was already very flattering. The suspense made it even more exciting, wondering who would give me a cake. When the cake was finally delivered, I immediately opened the card to find out who it was from. I never would have guessed it. Why ? Cause she lives in the US and is at the other side of the world from here. But with the greatness of technology and ecommerce, she was able to order a cake online and have it delivered to me locally. In the card said "Happy Holidays Kuya Jay ! I know it would be too late to send a card out there... so cake na lang! ;) Enjoy !" Awwwww.... it was my cyberbunso all along ! I was extremely touched. It was such a nice gesture from someone I totally wasn't expecting anything from due to our geographical distance. It also came at a perfect time to start the year with. 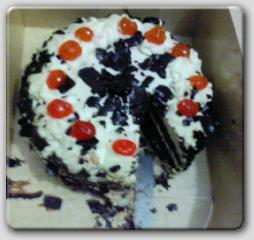 And by the way, I do love Black Forest cakes especially the cherries on top. I love you Erye. Thank you for being a true and dear friend. Take care always. I really appreciate it. Someday, I hope we'll see each other again. Thank you. Wow naman...sana may kaibigan din akong ganyan! Sabihin mo naman sa kanya padalhan din niya ako ng Choco Marjolaine!^_^joke.